“Lover, Lover” country singer Jerrod Niemann is thanking his lucky stars today: He — and his crew — managed to avoid a fiery explosion that destroyed his tour bus. Country singer Jerrod Niemann was coming off a great night of performing when his bus ignited on fire, leaving him and his crew without a ride back to Nashville. The “Lover, Lover” singer just finished performing at the Heart Strings for Hope benefit in Chattanooga, Tennessee when a friend alerted him to the bus fire. The singer didn’t believe it at first, but another confirmation sent him packing in a hurry. He had a good sense of humor about it though, posing for an obscene picture in front of the burning bus. Luckily for him, he won’t have to deal with insurance claims and all the headaches that come along with it — he was only borrowing the bus. Ouch! 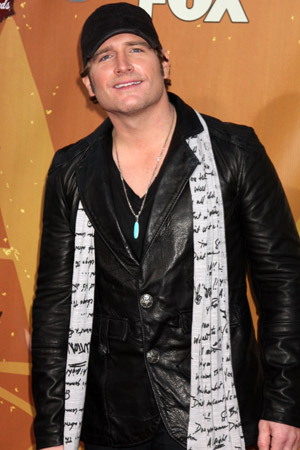 Someone’s not going to be very happy — and it’s not Jerrod Niemann! We just hope the dealer had plenty of insurance on it. Have you ever experienced a scary car fire like this?